Bluejohn is a great canyon and an excellent intro to the Roost. There are many forks of Bluejohn, and this is maybe the best combination put together by my friend Ram 15 years ago. This loop descends the cool narrows of the East Fork and ascends the Main Fork, through a spectacular tall narrows section, and then up a steeper section with chockstones and short drops. None of the climbing problems are particularly exposed, and all can be belayed once one person is up. Rumors of bolting-up required in the East Fork are highly exagerated. After the second rappel in the East Fork, a short drop is passed by "sequencing" people down (rappeling off a braced canyoneer), then carefully spotting the last person down. Soloing this drop would be difficult. From time to time, there is a long and incredibly cold pool just after the third rappel. Always bring a dry bag and be prepared to swim on this route. The name Bluejohn Canyon is now infamous for a single, lonely, unlucky descent, told in the book Between a Rock and a Hard Place; and Hollywooded up in the movie 127 Hours. To me, the route Aron Ralston chose is a long, unspectacular slog with brief sections of mildly technical narrows - perfect for a long slow distance solo training run on a beautiful spring day. Many say Aron was reckless - I say he was spectacularly unlucky, and I am oh so glad, 123 hours later, he came up with a brilliant idea. The movie is good - go see it. Re-creating the events out in the wild, however, is not recommended. Many non-canyoneers are excited to visit the spot of Aron's near-demise. Necro-tourism? It really does not look like much, and is far from the best spot in the canyon, let alone in the area. The jog out to the Blue Pool (160 miles each way) is a bit far for most day-hikers. Even Aron's mildly-technical route is not suitable for people without rappelling and downclimbing experience, and really is a poor route for beginners anyway. Getting into the sport? There are plenty of professional guides available to show you a canyon or two. If you have some training, browse around our site. There are much better canyons for introducing yourself to the sport than Aron's route - including the East/Main Bluejohn loop detailed here. Long loop route that starts and ends at Granary Spring. Helmets, rappelling gear, webbing, rapid links, drybags. Not usually necessary; after rain there are long wades/swims. The exit up the Main Fork requires 5.6ish climbing with little exposure. A beautiful day in the Roost with Hank and Alicia. From the junction of Utah Highway 24 and the Goblin Valley Road, drive south on Rte 24 about 1/4 mile to a signed dirt road on the left that heads south and east toward Hans Flat, The Maze, and Horseshoe Canyon. Follow this road 23.8 miles to a prominent junction with a sign. Turn right (south), saving Horseshoe Canyon for another day. Continue south 7.1 miles to a fork. Go Left toward Hans Flat Ranger Station, and continue another 2.7 miles to a small dirt road on the left (east). Follow this .2 miles to 2 scrappy buildings and a cowed up yard. Park here. All roads are suitable for 2WD cars, but can become impassable with rain or snow. (UTM: 561823mE, 4243944mN) All coordinates are WGS84 Zone 12S. Meander downcanyon. A nice slot is downclimbed with ease, and then a larger drop is encountered. Rappel 40' or so off a log or other natural anchor into the narrows. (This rappel can be avoided by walking around on the right). 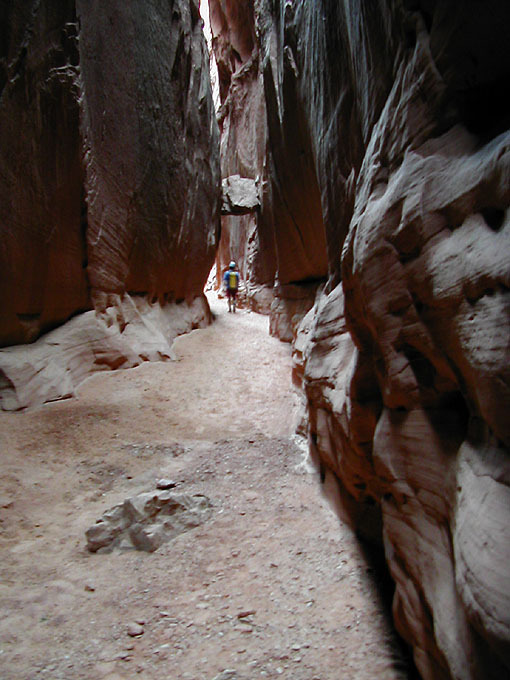 The canyon is interesting and narrow for quite a ways - climb, clamber, stem and squeeze downcanyon. One bolted drop requires a 30' rappel. Soon after, the canyon runs into a big wall, and a small drop marks the junction. Sequence most of the party down, then spot the last person from below - no anchor required. (Sequencing is where folks rappel off the braced body weight of the canyoneers above - leaving the last person in the sequence to downclimb into the waiting arms of the grateful masses below). Turn left and slog upcanyon. After another hour or so, just as you are wondering if this is really worth it, the canyon narrows spectacularly. The sandstone walls sweep upward in virtual cathedrals. It's really nice. Somewhere in here, the canyon forks - stay left with the main canyon. 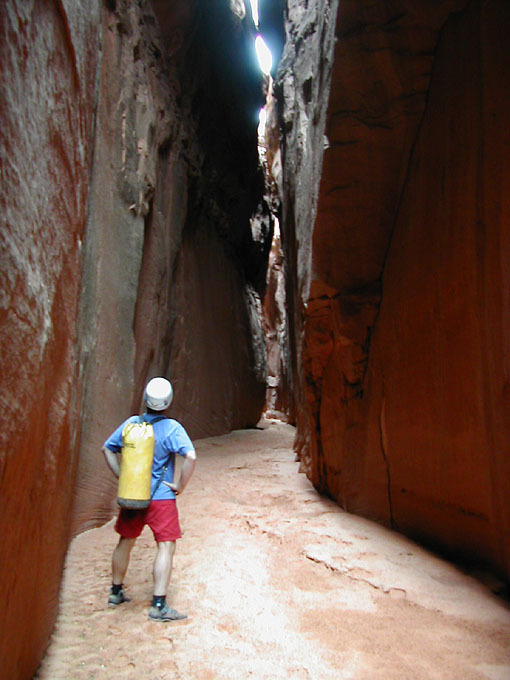 The narrows leads to a series of climbing obstacles, your penalty for doing the loop this way. Stem, chimney and offwidth up the various obstacles, passing packs as you go, and make your way to the top of the narrows. While reasonably difficult (5.6?, 5.8? ), the climbing is never exposed, not too strenuous, and weaker members of the party can be belayed from above. Out in the open again, follow the now shallow canyon south. A few short dryfalls are easily climbed around - but be careful - we found a rattlesnake blocking one of the up-climbs in a potentially disasterous spot. Keep your eyes and ears open. After a couple of dry falls, another hour of slogging up cowed-up soft sand finally leads back to Granary Springs and your car. Saturday, a trip through Lower Squeeze was delightful and uneventful. Sunday was a day for Blue John Canyon. Ram gave us the beta and we headed over, starting at an incredibly crapped-out cowboy camp just off the Hans Flat road.